This is number eight in a series, so there is backstory for these characters that I don't know except for what I picked up in the story. This didn't create any problem in following this story; it just hints a more behind these characters than what's on the page here. 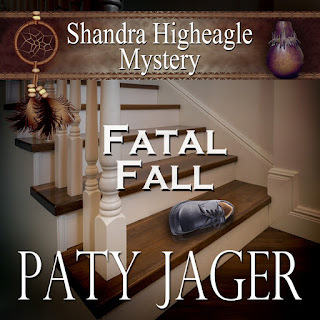 Shandra Higheagle is Native American, and sometimes has dreams that feature her grandmother sharing, in somewhat opaque fashion, information she may need. She's also a potter, with a growing reputation, and a craft show she's supposed to be selling her pottery at in a couple of weeks. It's really not convenient that she's sick, which is why she's at Dr. Porter's office, and finds out that he's had to rush home because something happened to his aunt. Shandra, incurably curious about people and odd events, decides to swing by there--especially once she realizes her boyfriend, Detective Ryan Greer, is also headed there. 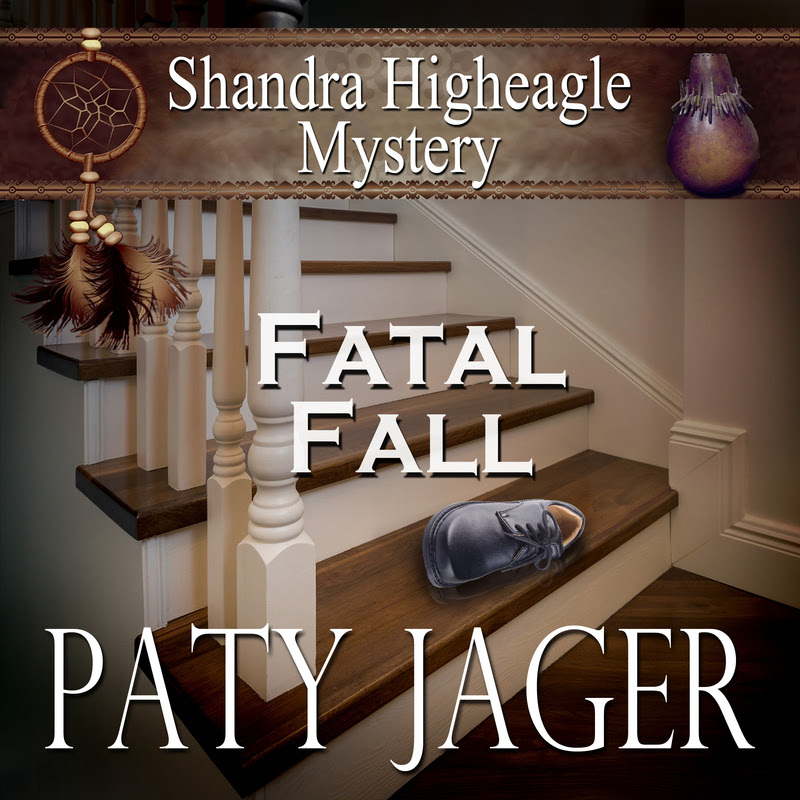 Dr. Porter's wealthy aunt, owner of the house, has fallen down the stairs and died. A sad but not shocking accident, except that it doesn't appear to have been an accident. There are fresh bruises on her wrist, and the oxygen tank that she needed when she moved between floors, is nowhere to be found. There's a writer who has been living there, writing the aunt's memoir, whom Dr. Porter didn't approve of. The housekeeper, Mrs. Alvarez, seems oddly nervous, and it turns out she's been hiding her daughter in the house, who had been banned from the property by the now deceased aunt after stealing some jewelry. Then a woman turns up claiming to be the aunt's granddaughter (sorry, the aunt is mostly referred to as Mrs. [something], the pronunciation of which seemed to vary, maybe Norville? ), child of her illegitimate child that she was forced to give up for adoption. It's all very strange. Dr. Porter is certain the woman is a fraud. Ryan sees and hears things Shandra doesn't because she's outside. Shandra sees things Ryan doesn't see, because she's outside. And as as much as Ryan would rather she stay out of his cases, he doesn't ignore what she notices and passes on to him. Ryan and Shandra have apparently had complicated and perhaps traumatic romantic experiences in the past, and are working their way toward being able to make a full commitment to each other. What I really like is that they behave like adults, and treat each other with respect. They've been through several murder cases together, with Shandra apparently a suspect in the first one. They've learned to respect each other's intelligence and judgment. Ryan doesn't give her too hard a time about her "snooping," as long as she doesn't lie about it, and she doesn't lie, hold back, or kid herself that he doesn't know his job. The writing itself is not spectacular, but it is good, and some places where I thought I had complaints, running the sentences through my brain again led me to conclude that my real complaint was with the narrator, not Ms. Jager's writing. The narrator, Ann M. Thompson, manages to make many of the characters sound like they're always yelling in improbably high-pitched voices, while other characters sound just fine. She also has a tendency to place her emphasis in odd places, often making perfectly normal sentences sound strange and wrong on first hearing. I liked the characters. I liked Ms. Jager's story. The narrator, though, was a real obstacle to being able to fully enjoy it. Recommended, but with the suggestion that ebook or print might be a better choice than the audio. Important note: Shandra has a dog. Not only does the dog survive, but nothing bad happens to her at all. I received a free copy of the audiobook from the publisher, and am reviewing it voluntarily.